Students love their cheap eats. 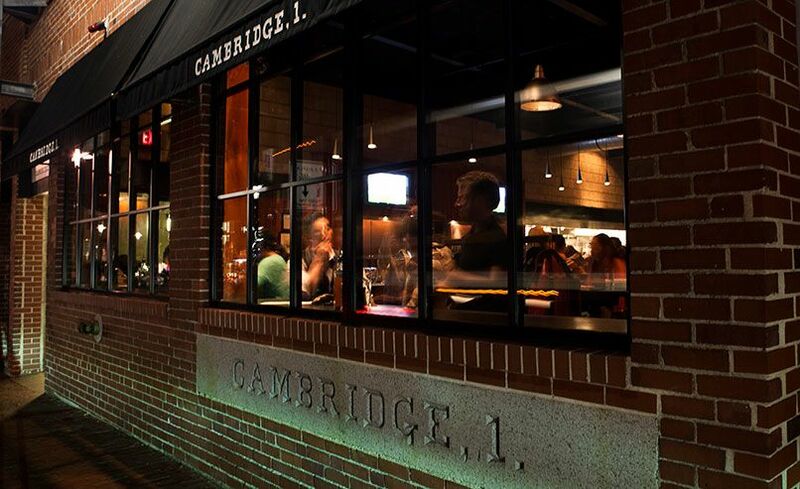 Which means there are plenty of family friendly places to eat around Cambridge. After you're done exploring the Museum of Natural History and your kiddos have zigged and zagged their way across the Harvard Campus, head towards Massachusetts Ave to hunt down some food. 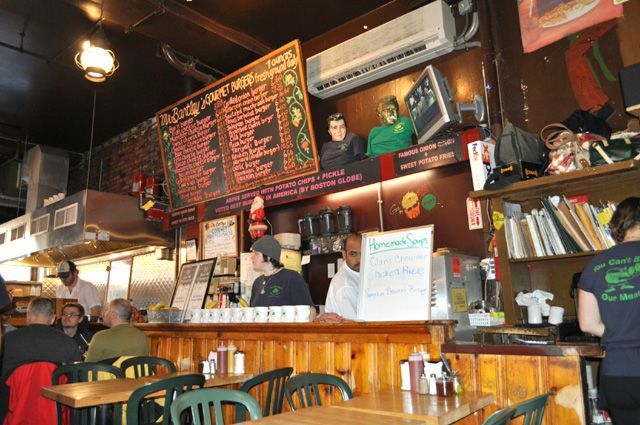 For the best burgers in town (and the country, according to the Boston Globe and the Wall Street Journal), follow the students and get on line at Mr. Bartley's Burger Cottage. The line moves pretty quickly and soon you'll be squeezed in at the crowded communal tables. The kitschy Boston decor will keep the kiddos occupied while you study the menu, trying to decide between the Mitt Romney burger (with Swiss cheese, grilled onions and onion rings) or the Mark Zuckerberg (Zuckerburger? with boursin cheese, bacon, and sweet potato fries). There's a kids menu (less complicated) and a huge milkshake menu that the little C&Gs are working their way through. Pick your cookie or candy and they'll mix it into your choice of milkshake. Little C&G loves his Oreo vanilla milkshake and Big C&G's fave is a Nestle Crunch chocolate milkshake. Be warned that Mr. Bartley's doesn't take credit cards, it's absolutely cash only. There is an ATM in the back or the restaurant (not sure of the fees), or the TD Bank ATM is on the next block towards the T station. Also be warned there are no bathrooms. Not even for little boys who are about to pee their pants. But if you head in the same direction as the TD Bank ATM, you'll find a Panera's and I'm sure they wouldn't mind. Mr. Bartley's is closed on Sundays and check their website for closings during college breaks. Grafton Street Pub around the corner is also a great place for lunch. It's a little fancier and definitely has more space to spread out (and bathrooms) than Mr. Bartley's. There isn't a kids menu, but if you go during the week there are pizzas on the lunch menu. Brunch is offered both Saturday and Sunday and their bloody marys are pretty amazing. When you find you've all eaten too much and are too full to move very far, stop into the Harvard Book Store right next door to Mr. Bartley's. A good bookstore is getting harder to find these days, and the little C&Gs always love to browse around for a while. They have a nice kids section all the way to the left (as you walk in) and in the back. 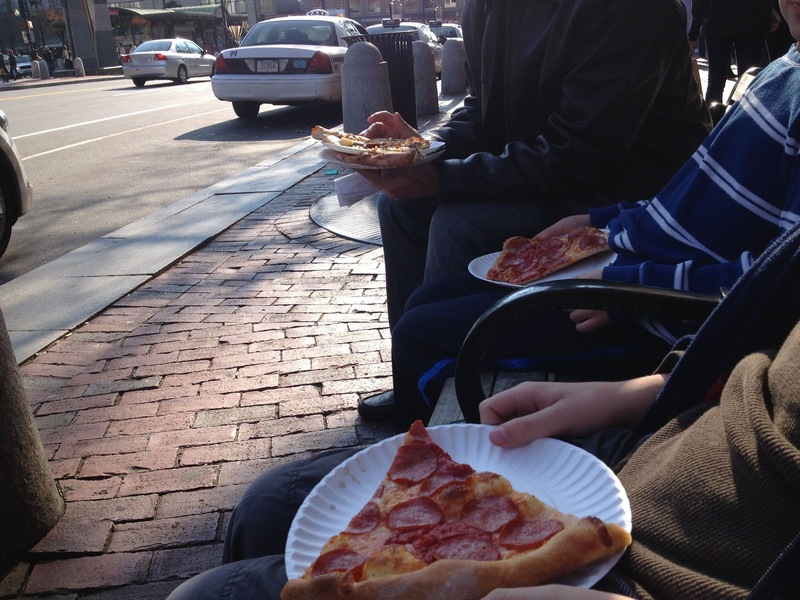 If it's just a quick slice you're after then head to Otto's Pizza across from the T station and next door to the Harvard Coop. Otto's is based in Portland and we are huge fans of their unusual combinations of flavors. They bake up a selection of pizzas all day in this tiny storefront and sell them by the slice (or you can get a pie) to go. Grab a few and head to one of the benches out front on the sidewalk and watch the busy students rushing by. Another favorite stop for pizza is around the corner from Otto's and up Church Street. 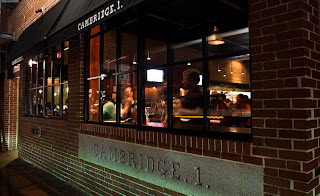 Located in the home of a former fire station, Cambridge 1 has an open kitchen where the kiddos can watch them make super thin crust pizzas. Salads are also on the menu and I've always been impressed by their great wine list. It can be pretty loud (from their tall fire truck accommodating ceilings) so no one will notice your noisy kids while you enjoy a glass of wine (or two). If you have any room left for sweet treats, you don't have to send the kids searching beyond Harvard Square. J.P. Licks on Mass Ave has ice cream, but sorry, no gelato. Sweet Cupcakes on Brattle Street has deliciously creative cupcakes. Little C&G loves the red velvets, and Big C&G loves the mini cups of frosting. Frosting, sold in a small chocolate cup, is such a brilliant idea. Because who ever has room left for the cake part? Certainly not any of us after eating our way through Cambridge.